MHG Insurance Brokers serves international clients, including most of the major cruise lines, luxury megayachts, expatriates, and travelers. MHG Insurance Brokers celebrated their 25th year of business in 2016. Abask was chosen by the company to refresh their marketing, to boost their online engagement and to promote the company’s credibility. The long-term project started in 2014 and continues today. We began by developing a strategy, implementing employee engagement programs and improving online engagement. We have since upgraded all of their social media and PR (including blog posting), delivered a brand new website, elements for event marketing, and created ebooks. This brochure is a special print piece that folds into a square, but as unfolded, tells the story of MHG’s success. 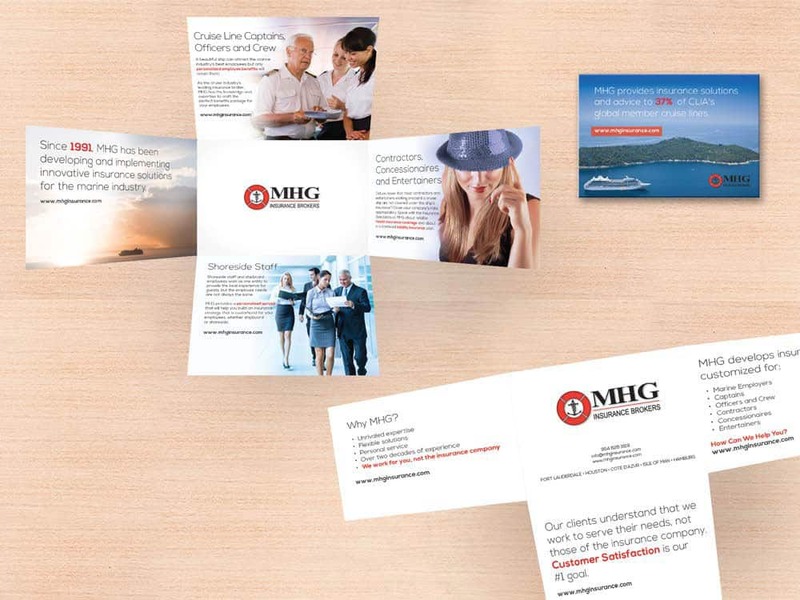 THE WORK: MHG has a large presence at cruise conferences and needed a standout piece for handing to passers-by. We wanted this piece to be unusual as opposed to the standard tri-fold brochure that ends in the trash. This piece stops people as they are engaged by the simplicity of opening it up to read about MHG. This piece will be remembered and MHG can start to build relationships in this way.